Progress continues with the replacement of the V.8 Road & Big Salt Wash bridge, box girders were set Thursday afternoon. 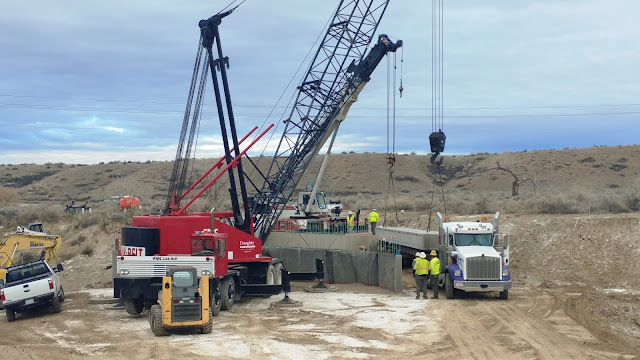 Mesa County received a $450,000 Department of Local Affairs (DOLA) grant to assist in the construction of the $752,000 V.8 Road & Big Salt Wash bridge. The project is expected to be completed early this summer. Mesa County Public Works Director Pete Baier talks to KREX News Channel 5 regarding the Mesa County Commissioners signing a Memorandum of Understanding (MOU) with the City of Grand Junction County for a preliminary environmental study for the proposed I-70/29 Road interchange. See the interview at http://www.westernslopenow.com/news/local-news/entering-new-phase-for-exit/1063869775. Mesa County Public Works Director Pete Baier explains to KREX News Channel 5 that the purpose of the MOU with the City of Grand Junction is to establish lines of communication and responsibility for items necessary to accomplish a Planning and Environmental Linkages (PEL) study of 29 Road from Patterson Road (F Road), crossing I-70 and landing on a new connecting road north of I-70 to the Grand Junction airport. Mesa County Commissioner Rose Pugliese talks to KKCO News 11 Reporter, Crispin Havener, regarding illegal gambling in Mesa County. Pugliese testified before the state legislature last week in support of HB18-123, Internet Sweepstakes Café Revise Legal Terms, concerning clarification of the laws governing simulated gambling activity. Associated Governments of Northwest Colorado (AGNC) hosted a board meeting in Palisade, Colorado to update commissioners and administrators on state and federal issues. Mesa County Commissioner John Justman, Fruita City Council Member Ken Kreie and Betsy Bair Regional Director for United States Senator Cory Gardner at the AGNC meeting. Mesa County Commissioner Scott McInnis at AGNC's meeting. Page Tucker with ProStar gives AGNC members an update on programs and services they are working on to collaborate with local governments. 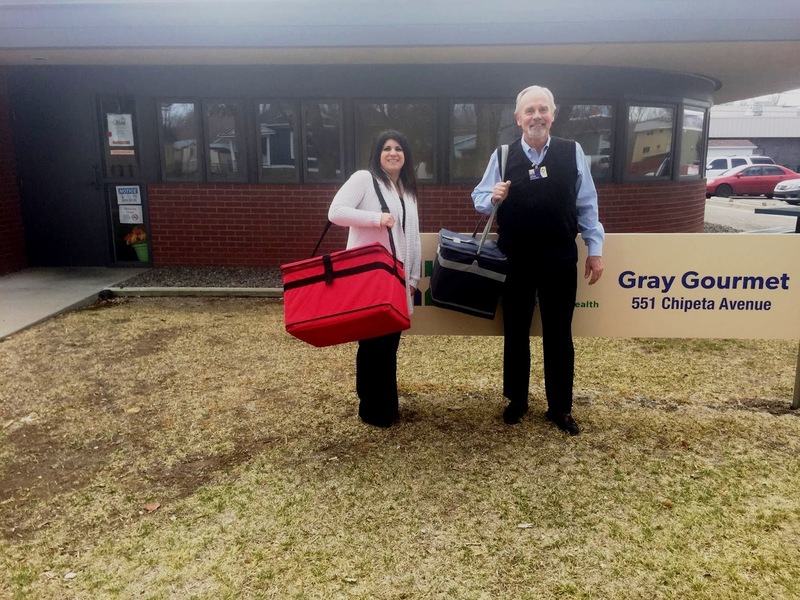 Mesa County Commissioner Rose Pugliese delivers meals on Wednesday with Doug Colaric for Gray Gourmet. Mesa County Public Works staff and Dan Frank, Mesa County purchasing agent, conduct a bid close meeting for the Phase 7 RFP for liner construction at the Mesa County Landfill. 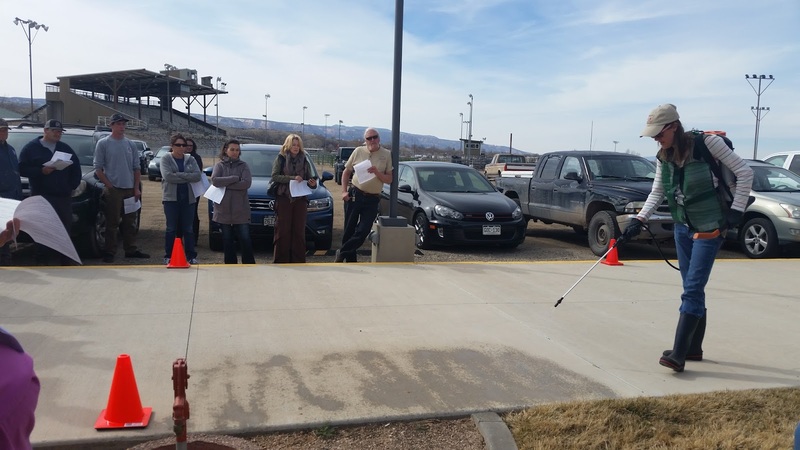 CSU Extension Master Gardeners participate in a demonstration about pesticide equipment and use. 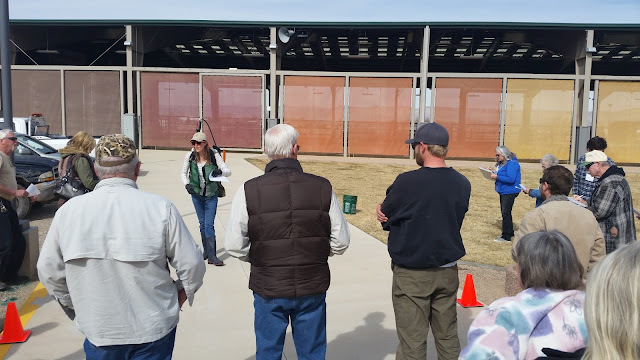 Teresa Nees with Noxious Weed & Pest Management explains how to easily set up spraying equipment so that pesticide application can be done in a safe and effective manner. Teresa Nees with Noxious Weed & Pest Management demonstrates how to calibrate the volume of solution dispensed by spray equipment to determine the proper amount of pesticide to use. The demonstration was held for the CSU Extension Master Gardeners who are taking an 11-week course as part of becoming a certified Master Gardener to help our landowners with questions ranging from turf to flower beds, vegetable gardens, and trees. Mesa County Commissioner Rose Pugliese along with Grand Junction St. Baldrick's staff and community members affected by childhood cancer, get ready to testify in support of HB18-1255, Childhood Cancer Awareness Special License Plate, before the state legislature remotely from Colorado Mesa University. Commissioner Rose Pugliese testifies remotely with local community members affected by childhood cancer Wednesday afternoon, on the license plate bill for childhood cancer research. Commissioner Pugliese is proud to be supporting such a worthwhile cause. The bill passed the House Transportation and Energy Committee on a 12-1 vote. Jackie Campbell, left, with Arapahoe County Clerk Matt Crane, Sheila Reiner, and Bobbie Gross. Arapahoe County was the first in the state to install renewal kiosks with Mesa County being the second. 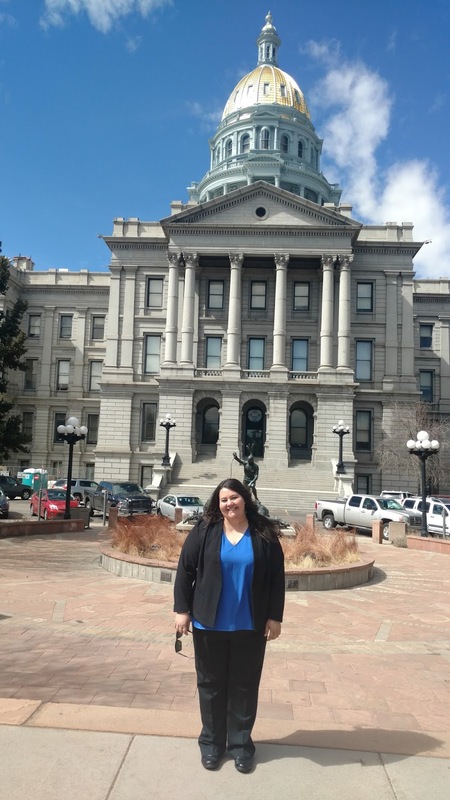 Motor Vehicle Manager Bobbie Gross at the Colorado State Capitol. 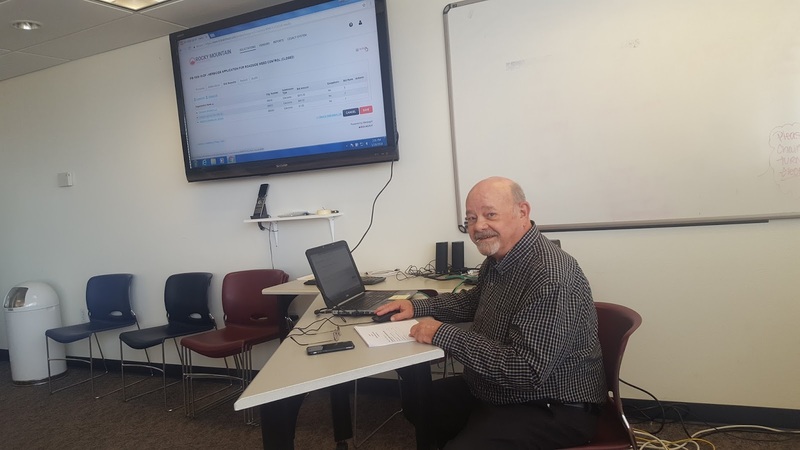 Dan Frank, Mesa County purchasing agent, prepares for the public bid opening for the Roadside Weed Control contract. 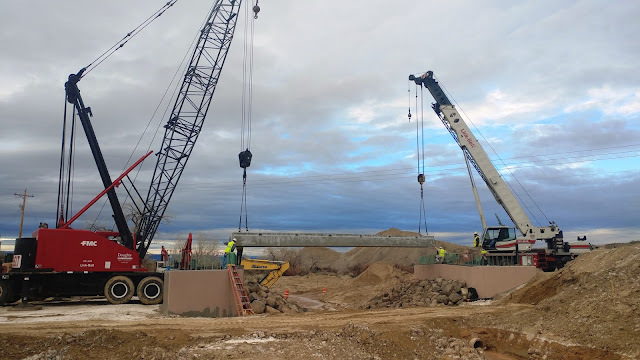 Work continues on the Veteran's Memorial Park Detention Project at the Mesa County Fairgrounds. Dirt work is almost complete, and the irrigation system is going in to make the place green! The Mahindra Arena is all groomed up ready for the CWBRA barrel race happening Saturday, March 24, from 10:30 a.m. to 3:00 p.m.
Cody Schmalz with Mesa County Solid Waste blades the road at the landfill to keep the road open for vehicles to drop off their waste. It's back! 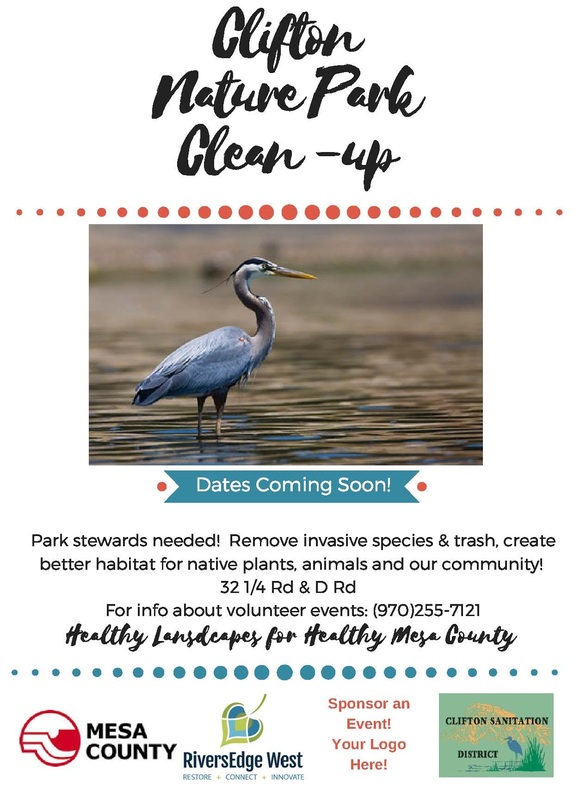 Get ready to join Mesa County Noxious Weed & Pest Management and fellow community members at the Clifton Nature Park for clean-up events! Clifton Nature Park is a Mesa County open space at 32 1/4 Road and D Road that has a connection to the Riverfront Trail and is very popular with fishermen and bird watchers (blue herons, osprey and barn owls can be seen here!) as well as people wanting to get out and get some fresh air. Mesa County and RiversEdge West (formerly the Tamarisk Coalition) are coordinating continued efforts to keep the weeds at bay, promote native species growth, and encourage the community to get involved to keep the park clean and safe. In 2017, Alpine Bank, Target, Ducks Unlimited, Toxic Calls, United Way and others joined us for our first series of successful volunteer events. 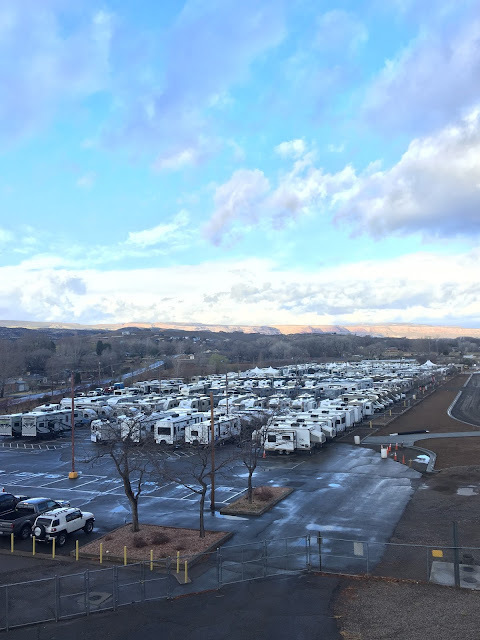 Several trailer loads full of tumbleweeds, trash, and tamarisk cuttings were removed, which made a noticeable difference in the cleanliness and aesthetics of the park. If your group or business would like to sponsor a volunteer workday, we would love to speak with you! 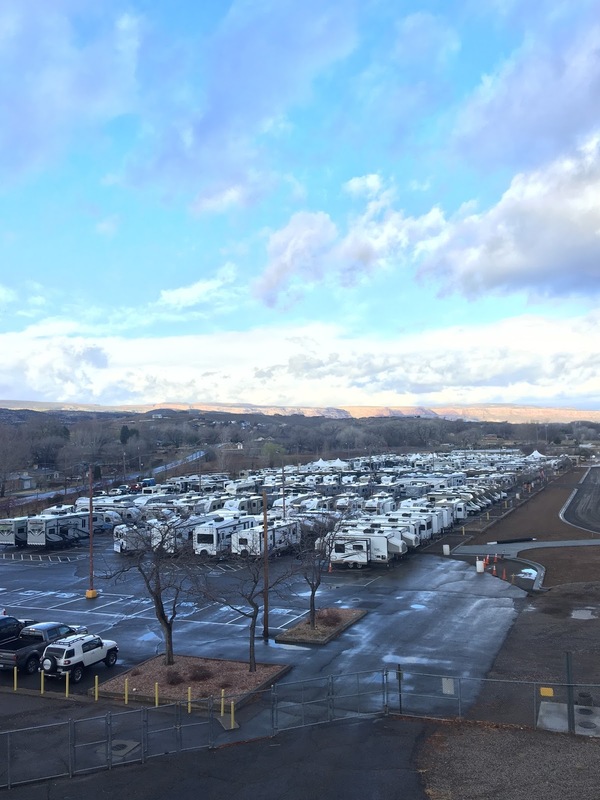 At Wednesday night’s City Council meeting, City Council authorized signing a Memorandum of Understanding (MOU) with Mesa County for a preliminary environmental study for the proposed I-70/29 Road interchange. The Mesa County Commissioners authorized signing the MOU at their Monday, March 19 Administrative Hearing. The purpose of the Memorandum of Understanding is to establish the lines of communication and responsibility for the various work items necessary to accomplish a Planning and Environmental Linkages (PEL) study of 29 Road from Patterson Road (F Road), crossing I-70 and landing on a new connecting road north of I-70 to the airport. The PEL study is slated for completion by fall 2018. 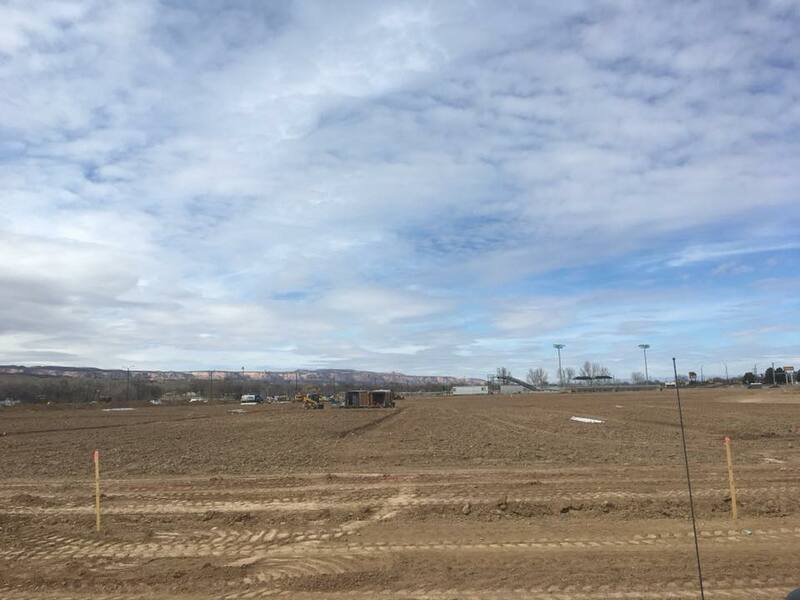 The cost of the study will be split evenly between Mesa County and the City of Grand Junction. A request for proposals for a firm to conduct the work will be issued by Mesa County soon. A PEL study is the first step in the process to gather information that will be used to identify transportation issues and environmental concerns with the project. The PEL study intends to develop the purpose and need for the project, determine project size, and develop and refine a range of alternatives. 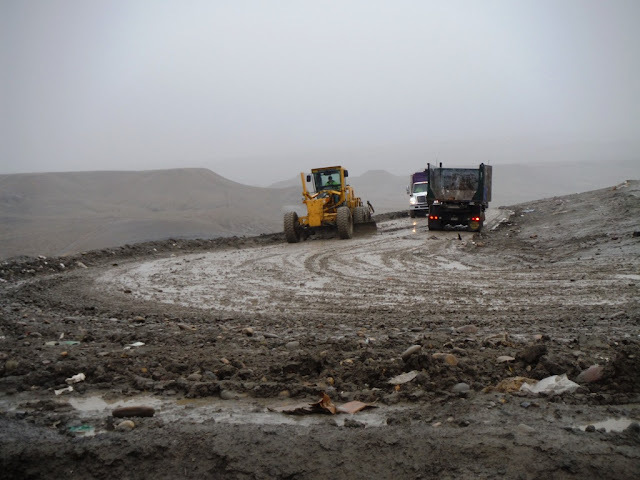 The PEL study will link planning to environmental issues and result in useful information that can be carried forward into the National Environmental Policy Act (NEPA) process as part of the Colorado Department of Transportation’s Policy Directive 1601 Planning Process. The Mesa County Noxious Weed Advisory Board is seeking Mesa County residents with various backgrounds, and environmental, recreational, agricultural, or industrial interests to become members. 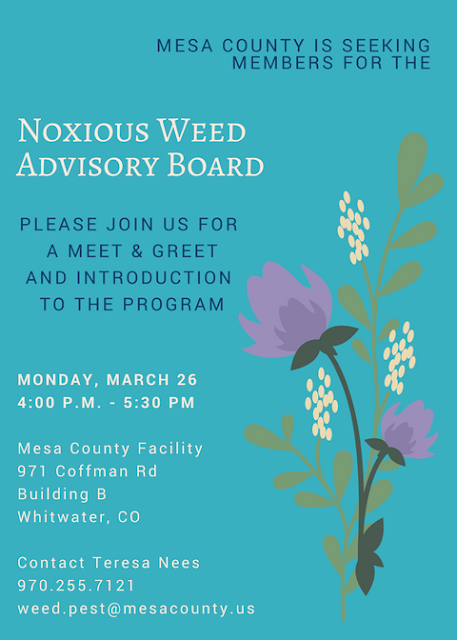 Noxious Weed Advisory Board members will work with the Coordinator for the Noxious Weed & Pest Management program to uphold the requirements of the Colorado Noxious Weed Act (CRS 35-5.5 link here) with the overall goal of implementing effective management strategies for invasive plant species for the betterment of Mesa County and Colorado.